GUEST BLOG / By Edward Jones & Co.--Prospects for economic growth should improve in 2018 and 2019 as higher government spending adds to the boost from tax cuts. The economy has added more than 200,000 jobs per month, business investment is rebounding, and interest rates remain relatively low. More sources of growth mean the economy should be strong enough to absorb higher uncertainty from possible trade disruptions. Moderately faster growth – Solid job growth combined with the individual tax cuts should help power consumer spending higher. Housing and vehicle sales are benefiting from still-low interest rates, and corporate tax cuts are encouraging an ongoing rebound in business investment. In addition, the economy will get a boost from fiscal stimulus over the next two years due to the provisions in the recent federal budget agreement. But that spending raises the deficit, and the Congressional Budget Office projects the deficit will exceed $1 trillion per year starting in 2020. Higher deficits and their related faster growth are good news short-term, but may accelerate the timing of the next downturn. They’ll also need to be addressed in the future with some combination of higher taxes and fewer benefits. Recession and financial crisis. As the chart shows, long-term investing worked. 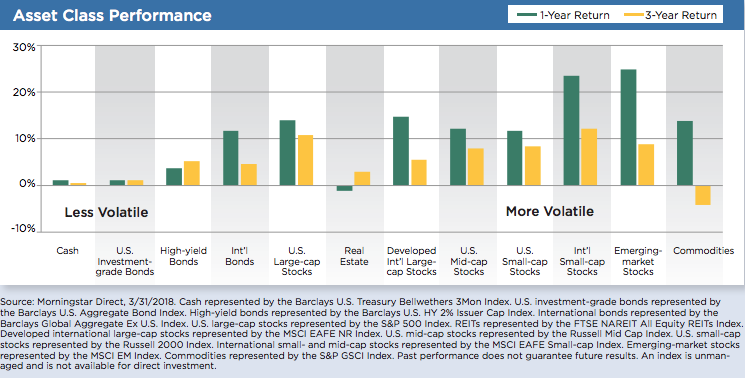 Stock returns (S&P 500) averaged 8.5% per year over the following 10 years, and bond returns were 4% per year. 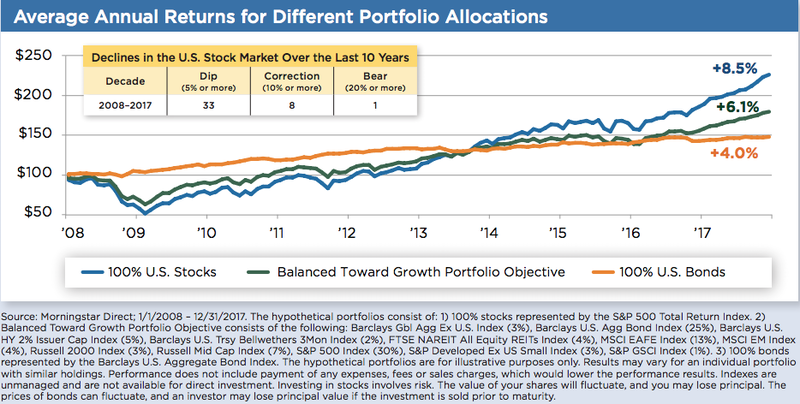 A well-diversified portfolio including international investments and our other recommended asset classes had an annual return of 6.1% per year. Don’t let today’s concerns stop you from working toward your long-term financial goals.